Description: Listen closely. You can almost hear the soft whisper of the pine branches as they dance in the wind. 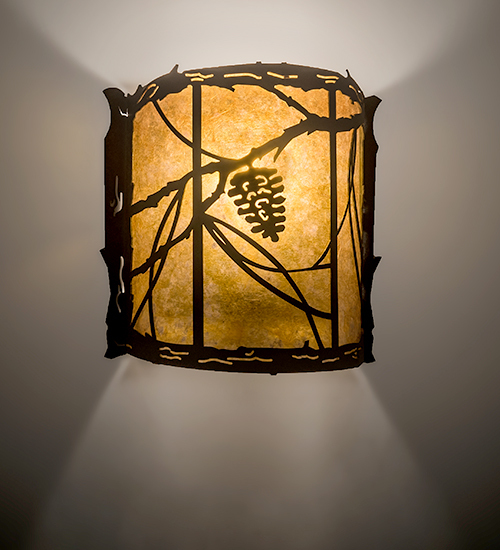 Enjoy the ambiance of soft beautiful light diffused through this Amber Mica shade featuring a stunning Pinecone and Pine branch design. Hand finished in a handsome Coffee Bean hue and handcrafted by highly skilled artisans in our 180,000 square foot manufacturing facility in Yorkville, NY at the foothills of the Adirondack Mountains. Create the design, colors, and the size and style of your choice. Dimmable energy efficient lamping options available. The ADA Compliant sconce is UL and cUL listed for dry and damp locations.